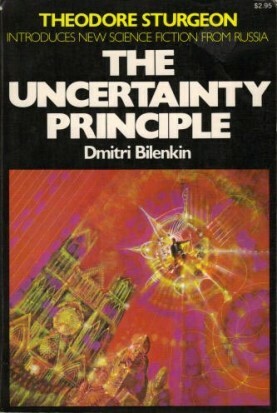 by Dmitri Bilenkin, 1978, 176 pages. TLDR: 2 out of 5 for bland stories with a dash of charming and a phase-shift of perspective. This book contains 18 short stories. Most of them little more than vignettes, under 10 pages long. Their settings vary from planets to space ships to earth in the present and near future, but the settings are usually little more than a skein - they are embellished only enough to serve the story, and go no further. This isn't explorer's SF, but the stories do share some of the same traits that I enjoy in the Strugatsky brothers - an appreciation for the absurd in life, and an eye for the human condition. To give some examples, the Snows of Olympus is about several men climbing the slopes of Olympus Mons on Mars simply because it is there. They get into a discussion about the meaning of meaning. One of them concludes that the act of doing something because it is there must be a universal constant, and the conclusion is born out by something they discover on this highest mountain in the solar system. In The Painter, a man who heads out into the wilderness to paint the perfect nature scene is continually interrupted by the nature parks servobots. In What Will You Become a man reveals that his son Mick is really a clone of Atilla the Hun when another man comes complain that Mick is jeopardizing his career as a 'thinktician'. My favourite story in the collection, The Man Who Was Present, is about a man who's is drawn to the productive energy of people around him, and whose mere presence enhances that energy. Not every tale is equally interesting (some are downright bland) but there's enough to get the juices flowing if you like social SF. They aren't high concept, but you can feel the perspective shift. The writing style is pretty spare, though there are some interesting and humorous turns of phrase. There's something about the writing that makes these stories seem naive, and I wonder if that can be partly attributed to the area and and time in which Bilenkin was writing. The Strugatskys don't come across this way, but I'd like to give Bilenkin the benefit of the doubt. The article linked to below gives some added perspective. Recommended if you want to dabble in a bit of unusual social SF, or if you want a different perspective. Most of you, though, will probably find these stories on the bland side, with a dash of charming. 2 out of 5.